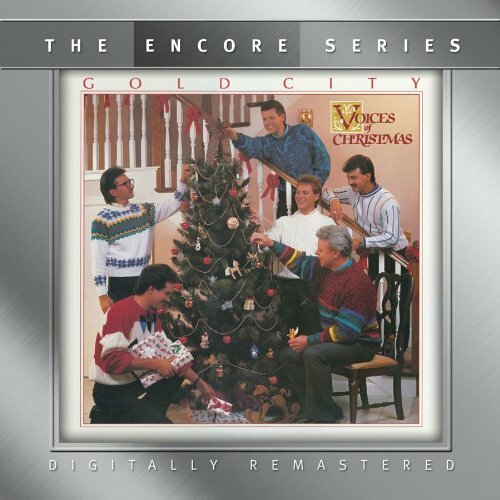 Since I haven’t done of of these in a couple of years, and since I’ve inexplicably never done a classics corner on this album, let’s get into the Christmas season by highlighting an absolutely stunning Christmas album from Gold City. Released in 1988, this CD features the super-group lineup of Brian Free, Ivan Parker, Mike LeFevre, Tim Riley, with Garry Jones and Jeff Hullander comprising the Band of Gold at the time. Jones, as always, produced and arranged this project. Awake My Soul – The quartet gets things going with an incredible, though short acappella song right out of the gate. There’s two verses with a key change between them with a nice power tag, and Tim Riley dropping an octave on the last note. Angels We Have Heard On High – I featured this as a Christmas Hidden Gem several years ago. It’s a tremendous arrangement that features a stinging hot keyboard intro and fuses the traditional with the contemporary better than any arrangement of this song I’ve ever heard. It is absolutely my favorite arrangement of one of my favorite carols. It’s energetic, driving, and sung expertly by the group. The tag is exceptionally powerful as well. Merry Christmas With Love – The only “newer” song on the album, this is essentially a Brian Free cover of Sandi Patty’s popular Christmas song. Brian even sings this in the same key as the original. It’s a touching song that speaks of one who has suffered the loss of a loved one since the last Christmas and the comforting tendencies of the message of the Christmas story found in the visit of carolers. Beautiful and touching. O Little Town Of Bethlehem – Returning to an acappella arrangement, this carol starts with a solo by Tim Riley. The group then uses some two part harmony that then diverges into 4 part harmony. The trademark blend of this lineup is in full display here, and the group weaves its way through the complex chord changes and progressions found in this carol. Silent Night – Ivan Parker steps up to take the lead on this ballad interpretation of many people’s favorite Christmas carol. The first verse is totally solo, with a few surprising changes to the chording behind the familiar melody. The key changes for the second verse and the rest of the quartet joins in for the remainder of the song. It’s a very pretty arrangement that really accentuates the timeless lyric. A particular is the mini-cascading harmony toward the tag and the sustained chord before Ivan repeats the last line to finish the song. Simply gorgeous. It Came Upon The Midnight Clear – The group performs this carol acappella as well, which tends to highlight all the moving parts in the harmonies. There’s a really neat key change at the end of the first verse with the tempo slowing down for the second verse. There’s a great use of unison that gradually splits back into 4 part harmony. They change keys one more time before the tag. It’s a sparkling arrangement that the group pulls off deftly. Away In A Manger – This carol features Tim Riley singing the first verse solo. The group enters on the second verse in full 4 part harmonies, which creates a nice contrast from Tim’s solo verse. There’s some nice chords and suspensions in the harmony. They change keys a half step up halfway through the second verse. Tim then sings the first half of the third verse solo, then they go up another half step and the quartet enters again for the final lines of the verse, with Tim repeating the last line solo to close the song. Another very pretty arrangement. Christmas Medley – I’ve done a hidden gem post on this track as well. This may very well be my favorite track on any Christmas CD. They start with Good Christian Men Rejoice, first in unison then splitting into parts. They move on to “Joy To The World” in full harmony that ends up on a unison note. It gives the medley to that point a feeling of swelling then coming back together. Mike LeFevre then turns in what I still consider one of his strongest Gold City features with the first verse to “O Come, O Come Emmanuel.” The group hits power harmony on the chorus, then after a piano interlude they close the medley with the most powerful version of “O Come Let Us Adore Him” you will EVER hear. The power tag to the medley is one of my favorite musical moments ever. Wow. It’s almost enough to make a Baptist shout. Merry Christmas All Year Long – The disc concludes with a brief acappella benediction with layers of lush harmonies. It’s a perfect ending to the album. Summary: This is one of my absolute favorite Christmas albums. I look forward every year to being able to pull this album out and listen to it. “Angels We Have Heard On High” and the “Christmas Medley” are absolutely stunning. This was in the middle of Gold City’s heyday of the mid 80s through early 90s, and this project is a great example of why. Garry Jones’ stunning arrangements take these carols that everybody sings every year, and breathes fresh life into them. “Angels” has a wonderful driving, almost contemporary feel to it. The depth and feel of the “Medley” just consumes you and catches you up into the true spirit of Christmas. The acappella pieces just wash over you in waves of tight harmonies. This is one of those albums that is just what Christmas music should sound like. It’s long out of print these days, but I have a copy of this on a double CD with the equally as good A Cathedral Christmas, A Cappella album from the Cathedrals. You can still find copies of this floating around, and believe me it’s well worth the price. Both albums are absolute gold (pun intended, of course). The Gold City album alone was re-released a couple of years ago, so copies of it shouldn’t be too difficult to obtain. If you don’t have a copy of this, you need to get one, today! Since it is the Christmas season, and I previously did a series of Christmas “Hidden Gems”, I thought I’d do a classics corner on a very solid, yet sometimes forgotten Christmas album. Released in 1980 (and re-released in 2000 on CD), this album features the Imperials lineup of Jim Murray, David Will, Russ Taff, and Armond Morales. While by this time the Imperials were firmly entrenched on the forefront of the CCM scene, they still retained a significant following among SG circles as well. Child Of Love – The album starts off with a “new” Christmas song that gently flows with a bit of a classical feel. Jim Murray sings the verses in a minor key, with a shift to the major key for the chorus and some really nice harmony from the group. The chorus also has more of a “contemporary” ballad feel to it. A very enjoyable opening track that showcases this group’s ability to blend. It Came Upon A Midnight Clear – Another slow, flowing ballad arrangement on this song that features Jim Murray on the Christmas classic. When the entire group joins, David Will takes over the lead part and Murray jumps to the tenor above him. There’s a nice key change at the end of the first verse that leads to an instrumental break with some beautiful “oohs” from the group that is the Imperials at their vocal best. While still a ballad, the tempo doesn’t drag, but instead moves along at a nice leisurely clip. Some more “oohs” tag the song quite beautifully. Mary’s Boy Child – David Will steps up to sing this classic tune that includes some female background vocals in addition to the quartet. It’s a bouncy arrangment that features some nice percussion and lets the acoustic guitars drive the verses. It’s a nice arrangement, but as with the others, almost seems too effortless. O Come All Ye Faithful – There isn’t a clear division between this song and “Immanuel”, which makes me think it was originally intended to be a medley. It’s a fairly traditional, straight forward rendition of the first verse and chorus. The chorus is then repeated with the “For He alone is worthy” lyric, and then the pop feel somewhat returns for the power tag led by Russ Taff. Great song, especially considered as a medley. Christmas Praise – This song was penned by Jim Murray, and returns to the flowing classical feel of the first couple of tracks. The chorus features some smooth swirling harmonies. It’s a very pretty song with some really great lyrics. Silent Night – The intro to this song features some more breathtaking “oohs” from the group, then Armond Morales comes in for the first verse. Again, this is a fairly traditional rendering that features some nice background vocals behind Armond’s lead. These guys could really sing well. The oohs are repeated after the first verse including a key change with some cascading style harmonies. Russ Taff sings the next verse. The oohs are repeated to tag the song. Again, a very pretty song. What Child Is This? – The most unique arrangement of this song you will ever hear. It’s given a pop/jazz arrangement and sung very soulfully by Russ Taff. It is almost unrecognizable from the typical variation of “Greensleeves”, but it is also the single best track on the album. The track is basically a Russ Taff solo, but it’s absolutely incredible. O Little Town Of Bethlehem – David Will comes back to sing this very mellow arrangement of the timeless carol. There is some smooth harmony behind Will’s lead vocal on the first verse, as well as some nice group harmony on the second verse. There’s a brief appearance by a choir on the second verse as well. This one is short and sweet. O Holy Night – This song again features some female background harmony adding to the quartet with Jim Murray singing this great song. Murray has the classical sounding voice that fits this arrangement perfectly. While it isn’t stratospherically high, Murray’s vocal is outstanding. This is the style song that his voice was made to sing. A great way to end the disc. Summary: Outside of “Immanuel” and “What Child Is This?”, there aren’t a lot of risks taken in the arrangements on this album, but that isn’t to say the arrangements aren’t solid, nor the disc boring. Quite the opposite, actually, this is a perfect album to play to really get into the Christmas spirit. The vocals are top notch, the harmonies immaculate, and the two aforementioned tracks are placed perfectly to spice up the album. These four guys could really sing well. Russ Taff and Jim Murray both really shine on this disc in particular. 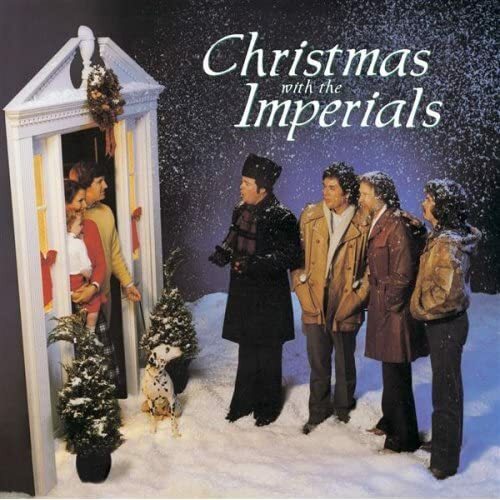 If you have the LP or CD, pull it out, give it a spin, and just try not to be swept up in the Christmas spirit by the smooth harmonies of the Imperials in their heyday! 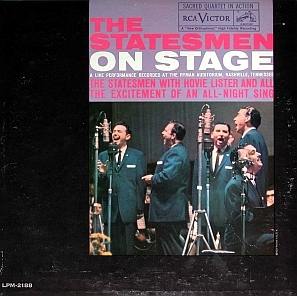 Recorded in late 1959, this RCA Victor album captures the Statesmen Quartet in a live concert at the Ryman Auditorium with their still fairly new tenor, Rosie Rozell. Jake Hess, Doy Ott, “Big Chief” Jim Wetherington, and Hovie Lister round out the personnel on this particular recording. I Wanna – The album gets off to a rousing start with this popular uptempo song that features Chief. This song has become a classic, being redone many times, but none measuring up to Chief here. Some have said that Chief goes a bit overboard here, but the performance is impeccable, especially the last chorus when the Statesmen kick in the modern harmony. It went over well enough to demand an encore. Thanks To Calvary – This is Vep Ellis’ classic, not the Gaither song that the Cathedrals made so popular. This is a midtempo song that features Jake Hess and Chief in the chorus. Jake sings the verses with some magnificent background harmonies from the rest of the group. For those who are only familiar with Jake through his Gaither video appearances, this is a great song to show what a great lead singer he was in his prime. The last chorus features some harmony inversions with Rosie taking the lead occasionally. Something Within – Another song that has been covered by everyone from Take 6 to the Dove Brothers. This song features each of the Statesmen, starting with Jake, then moving to Big Chief. Doy Ott steps up for the next feature, followed by Rosie. They set a pretty bouncy tempo for this song, and Rosie skies on the tag. This is a great song to introduce each of the members of the group. Room At The Cross – This hymn is, according to Hovie’s introduction, the most requested song the Statesmen sing. Rosie sings the melody on this very pretty version of the timeless hymn. The song is done slowly, but not so slow that it drags, which is a big plus. The Statesmen show that they can slow the tempo down just as well as they sing the uptempo numbers. The Amen Corner – One of Rosie’s signature songs comes up next as he gets a chance to show off his ability to sing the spirituals. Chief does a lot of vocal bass guitar runs during the song that I personally love. The crowd absolutely eats this up, as a song that barely clocks in at a minute is encored several times, so much that Rosie’s voice falters a bit on the last time through. Even the host of the concert “persuades” Hovie to encore it “one more time.” Of course, the crowd eats up the whole thing. He’s Already Done – This song starts off with Chief singing a slow, broad intro with the quartet behind him, and smacks a nice low note on the end of the intro. Jake Hess then takes the lead on a slow, methodical verse that you just know is building up to something else. This is a great example of Jake’s stylistic means of singing lead. At the end of the verse, Rosie takes the lead and the tempo picks up and begins to swing in a typical spiritual rhythm. This is a great song for the Statesmen. Jake reclaims the lead for the tag. Wade On Out – An incredibly fast paced song from Mosie Lister’s pen that features the quartet on the first verse, Doy on the chorus, then a key change and Jake on the second verse. Chief sings the melody on the second chorus until the end where Rosie takes the melody for the tag and hits an incredibly high note at the end. One of my favorites on the album. Gonna Open Up All The Doors – Sometimes called “Light Of Love”, the Statesmen go right into this song with no introduction. This is quintessential Statesmen and is encored. Another one of my favorite cuts on the album. This again has been redone many times, but no one can match the Statesmen. It’s Worth More – Slower paced song that features Jake Hess, and features some nice modern harmony in it as well, which showcases the immense talent of the Statesmen. Hess’s performance is great, and the harmony behind him is spot on. The last couple lines Jake inverts up for a nice powerful section. Rosie takes the tag and brings it back down with some nice harmony. He Set Me Free – This isn’t the same song that was redone by Greater Vision in the 90s. This one features Jake singing some nice vocal embellishments. A lot of lead singers should listen to Jake’s performance here to learn how to embellish a song without going overboard. Jake was a master stylist as a lead singer and this song definitely shows off that ability. Hymn Medley – Each one of the Statesmen step up and sing a verse and chorus or so of their favorite hymns. Chief starts off singing “O How Much He Cares For Me”, then Doy steps up with “He’s My Friend.” Jake then sings “Jesus Is The Sweetest Name I Know” and Rosie sings “Standing Somewhere In The Shadows” very sweetly. Hovie then sings “Jesus Is The One” and the group builds up to a power tag. Hovie encores his part after the rousing applause. This is Southern Gospel music at its best. Classic. Get Away Jordan – After the slow paced hymn medley, Hovie then sets the stage on fire to end the album with the Statesmen’s (arguably) most popular song. This is THE version of this song by which all others are judged. As has been pointed out, this is a much faster version than the studio recordings of the song. If you were to ask the average SG fan about the Statesmen, this is probably one of the songs that comes to their mind first, along with Rosie’s “Oh What A Savior.” At the end of this song, as the audience is applauding, you can hear some laughter rippling through the audience. Maybe one of our resident historians can shed some light on what the laughter was about. If you ask me what my favorite Statesmen album is, depending on the day I’ll either say Through The States or this album. This really captures the Statesmen in their heyday. Hovie’s MC work is masterful, and he has the crowd in the palm of his hand practically from the first notes of “I Wanna” and leaves them standing with “Get Away Jordan.” The concert is paced very well, and there are some classic moments on this album that every true SG fan needs to hear. Obviously this album is not commercially available, but it’s worth scouring yard sales, record stores, and the internet to find a copy. This is one of the Statesmen’s finest LPs and a must listen for any SG fan. Quartet fans will most likely fight each other over a nice copy of this one. It’s 1990, and The Kingsmen and Gold City (along with the Cathedrals) are ruling the roost in SG, so to speak. 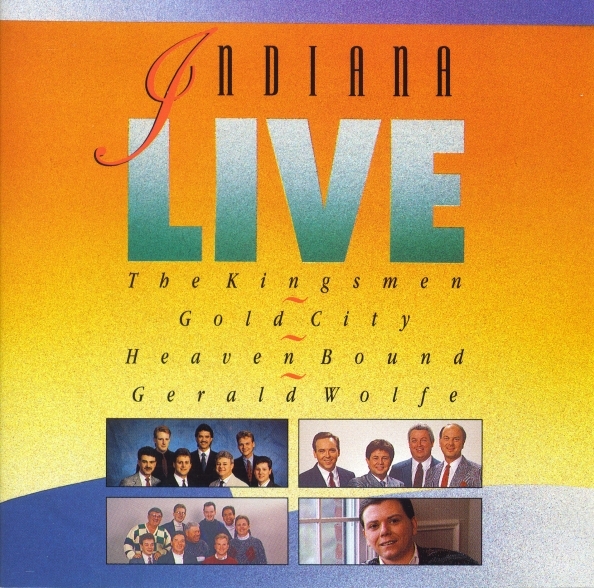 Benson brought those two groups together, along with the hottest trio at the time in Heaven Bound, and Gerald Wolfe, who hadn’t been gone from the Cathedrals long, for a live concert recording in Indianapolis, and fittingly, they called it Indiana Live. Looking For The Lights Of That City (Heaven Bound) – Nice mid to uptempo hand clapper that is Heaven Bound at their best. Great song with a nice key change in the middle of the last chorus. This was a great way to start the disc. It’s The King (Heaven Bound) – Powerful ballad featuring Rick Busby. Busby really knocks this one out of the park. The key changes after the first verse and goes immediately into the second verse, then another key change and the tempo slows and broadens for the third verse. The key changes again before the chorus. Another key change leads to the tag. Great ballad from Heaven Bound. I Feel His Promise (Heaven Bound) – Uptempo song featuring Lawrence Taylor on lead. This one really got the crowd going. Because He Lives (Gold City) – Ivan Parker takes the lead on the greatest version of this song I’ve ever heard. It’s similar to the Singing Americans version, but Parker pus a little more flair into this version. Nearly flawless vocals, including a key change between the first and second verses. Try not to be blown away. Oh What A Day (Gold City) – This one is interesting. Midtempo album cut from Portrait. What was a decent, but nothing special, album cut becomes a great in concert tune. Parker sings the fire out of the second verse, and the key change with Brian Free taking the lead is awesome. Movin’ Up To Gloryland (Gold City) – The classic LeeRoy Abernathy barn burner is performed expertly here by Gold City. This was a very popular song for Free, and he doesn’t disappoint. The piano work on this version is incredible as well. Gold City was just on fire here. I’m On My Way (The Kingsmen) – Midtempo tune that starts out kinda soft and smooth (at least by Kingsmen standards at the time). Tim Surrett keeps lead until the last chorus when Garry Shepherd takes the lead and the harmony inverts up. This is classic Kingsmen and the crowd loves every minute of it. No Man Can Stop This Army (The Kingsmen) – This ballad features Parker Jonathan in one of his early Kingsmen recordings. This hints at what was to come on songs like “The Cross Has Won Again.” Once again the crowd eats it up. 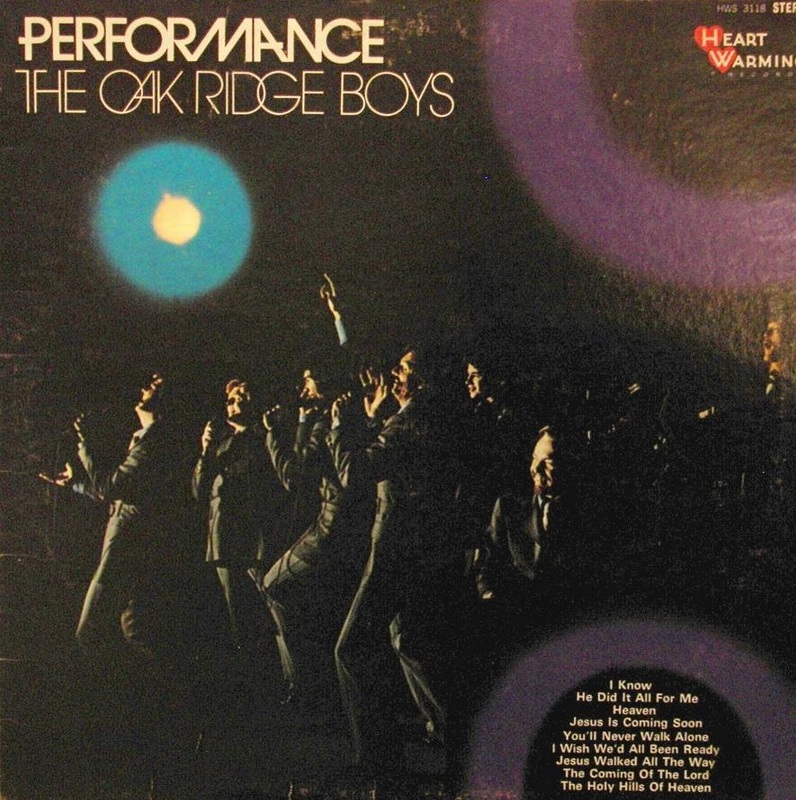 I’m Standing On The Solid Rock (The Kingsmen) – Parker keeps the lead for a chorus of this song, the key changes and Ray Reese sings the first verse, then Hamill takes the lead on the chorus. The key changes again and Sheppard takes the lead. This is typical “three chords and a cloud of dust” Kingsmen, complete with the screaming high ending. Champion Of Love (Gerald Wolfe) – Wolfe sings this with the original Cathedrals track, which is noteworthy because everything else had been done with a live band. His vocals are absolutely spot-on, and the crowd is clearly enthused, but I miss the power harmony of the Cathedrals surrounding him on the chorus. Still, Wolfe’s performance is excellent. What a voice. I’ll Fly Away – Everyone comes on stage for this sing-along that features Gerald Wolfe doing his impressions of Jerry Goff (which is really, REALLY good) and Peg McKamey Bean. It’s a fun little novelty track. It’s funny, on the first verse, half the people sing “to a LAND on God’s celestial shore” and the others sing “to a HOME”. Where The Soul Never Dies – A more serious “sing along” tune that is a bit of a precursor to what would occur a couple years later with the KingsGold concerts. Busby, Free, and Sheppard are featured on the chorus with a couple of key changes. Money quote in the intro from Hamill: “Keep clapping and they’ll keep taking it up until they can’t go any higher or one of ’em dies.” Classic. What a tremendous album. Give three of the hottest groups 3 songs each, plus a smash song from the guy that made it famous with the Cathedrals, then get everyone on stage for a couple of numbers. It’s a simple concept, but my how it worked. Gold City in particular was really strong that night, and the enthusiasm from both the performers and the audience is evident from Heaven Bound’s first few notes and doesn’t stop until the end of “Where The Soul Never Dies.” Long out of print, this is worth scouring yard sales, used CD stores, and ebay to try and find a copy. This CD is full of thrilling performances from groups who were at their peak. This is the long delayed and long awaited part 2 of the tribute to Jason Waldroup’s tenure with Greater Vision. This was Jason’s first mainline CD with Gerald Wolfe and Rodney Griffin and was released in 1996. He Set Me Free – Nice medium tempo convention style song. This song just bounces along nicely in a fairly traditional arrangement that would not have sounded out of place on a red back hymnal series CD. Jason takes the lead on the last chorus and the harmony is inverted. I’ve always liked Greater Vision’s version of this song. You can’t help tapping your toe and smiling while listening. If There’s No God – This is Rodney Griffin’s lyrical rebuttal to atheism by claiming that the evidence of God’s existence is found all around in the beauty of nature and the changed lives of believers. It’s a fairly slow, country twinged tune with solid vocals in a very low arrangement. Gerald Wolfe sings the second verse solo and turns in his typical strong performance. Once And For All – This is Jason’s first feature, a 3/4 medium tempo ballad style tune. Again this song is keyed very low. It is plain that Waldroup doesn’t have the high end that Allman had, but that Greater Vision would not suffer, that they could pull off the lower harmony just fine. It’s a fine tune, and Waldroup turns in a fine performance. He Gave Me The Well – This is, as far as I know, the original recording of Rodney Griffin’s classic song. It’s fairly straightforward, the same typical country ballad feel that others have given it. The main difference here is the quality of Greater Vision’s vocals. There is good reason they won so many favorite trio awards. Very smooth. Rodney turns in a good performance on the verses. I’ve always enjoyed hearing songwriters sing their own songs. There’s a special quality to the recording you just don’t get from someone else singing the song. This is true here. The Blood Hasn’t Ever Changed – Chris Allman penned tune that features a fairly soulful backing track and great vocal from Gerald Wolfe on the verses. Jason Waldroup sings the lead on the chorus. This is one of two Allman penned tunes, which makes me wonder if recording had started on this album before Jason joined the group. The harmony on the bridge excerpt of “Nothing But The Blood” is especially nice and a great key change leads to the tag. GV really shows some versatility on this song. One of the picks of the disc. The Shepherds Found A Lamb – Mid tempo country style tune with another very low arrangement. A VERY different arrangement of this song appears in the Christmas musical Unspeakable Joy which our church choir performed this past year. The two arrangements are in no way similar, if it was not for the lyrics, you would think they were two different songs. Good solid tune, with a nice word play on the word Lamb. I Don’t Want To Go Back – Jazzy mid tempo tune. This is one of the better tunes on the disc. Jason turns in a great performance, and features some of the higher notes on the disc, showing he did have some higher range, he just uses it very sparingly. Very enjoyable song. Spirit Of Brokenness – Quite simply, a masterpiece. I did a hidden gem on this as part 1 of the tribute to Jason here. As close to perfection as you can get. My Guilt Is No Match For His Grace – Country flavored ballad that features Gerald. This is the second Allman penned tune on the project. Solid vocals, smooth blend, but the backing track is a bit too country for my taste, too much steel guitar for me. I do like the lyrics to the song, very powerful and a great message. Lift Me Up Above The Shadows – Another red-back hymnal convention type song closes the disc. 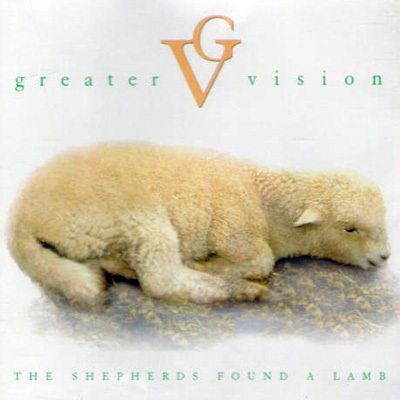 Greater Vision really excels on this type of song, as is evidenced by the popularity of their Church Hymnal series of custom CDs. The ending is the highest on the disc. Again, Waldroup did have some higher notes, he just used them very sparingly. This was a very solid debut for Waldroup, and a very solid CD overall from Greater Vision. “Spirit Of Brokenness” is one of the greatest songs that GV ever recorded. The low keys and arrangements are quite striking on this disc, I had forgotten just how prominent the low arrangements were until I listened again to the CD. On the whole, this CD doesn’t compare to Far Beyond This Place or When I See The Cross, but was a definite signpost along the way to Greater Vision’s “glory years”, for lack of a better term. Still, it is a very solid and enjoyable CD, and it’s definitely worth pulling back out and putting in your disc player. Well while we are waiting for Wes to fix his PC issues I guess I’ll make an entry. I guess that’s the benefit of having another contributer! I was hoping to find a version of “Give Up” by The Gaither Vocal Band with Michael English on YouTube but instead came across this one. This is from the Video “50 Years The Happy Goodmans” and according to amazon.com was released in May of 2000. In the version featuring English on Southern Classics, he sings both verses. This version however, Penrod and Phelps split the duties and Phelps really makes it his own and pretty much “steals the show” but in a good way! It’s stuff like this that I miss from Phelps, which hasn’t been captured in his solo contemporary recordings. My goosebumps had goosebumps and I almost had a shouting fit here in my cubicle…and I’m a Baptist! The video quality is on the grainy side but the audio is good.